Few things in life are as stressful as making a big change. This could be changing a job, relationship, where you live, or in our case, changing your body. Will you be ready when it's time to make a change? 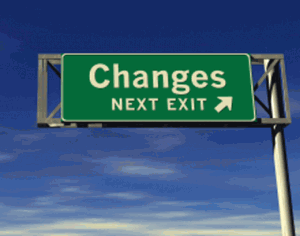 Regardless of what is changing you will find that you have a limited capacity to handle these changes. You can only handle so much change at once until it overwhelms your mind/body/spirit and leads you to a crash. This crash can manifest as a mental, emotional, or physical breakdown, or even all three. In order to change your body you must make a significant change in both of these areas, but you still have to be aware of your capacity to change, this however requires patience that many of us do not have or do not want to exercise. The tendency for most people will be a desire to make their body change faster that it’s capable of. Instead of accepting the natural limits of your capacity for change the desire is to force the change and make it happen as fast as possible without recognizing the necessity for gradual incremental changes that foster long term adaptation. This is “all or nothing” thinking and it’s certainly not a long term solution. In fact, this type of extreme thinking leads to yo-yo dieting and a lack of control over your body. You have to be intelligent with the way you divide your energy between diet and exercise in order to get the maximum benefit without leading yourself to a crash, a rebound and ultimately undoing all the work you’ve just done. Specifically when you have a significant amount of body weight to lose the bigger change will be from your diet and the smaller change will be from your workout. If you imagine that 100% of your capacity for change is being allocated to your body, then you could say at the beginning you will be putting 80% of that effort into diet and 20% into your workout. As you lose bodyfat and start to get closer to your ideal bodyfat levels you can start shifting your focus from diet to exercise. This is part of the reverse taper protocol we’ve recently discussed and how this method will lead you towards lasting changes in your body. Towards the end of your body transformation more of your mental and physical energy and capacity for change should be allocated to exercise and less to diet…the proverbial 20%/80% ratio should be reversed in favor of exercise. This is how you should be viewing your capacity for change and where you should be allocating your energy when you’re changing your body for the long term. In today’s podcast, we’ll discuss the ‘capacity for change’ and how to manage a body transformation with this concept in mind. We’ll discuss the reverse taper protocol and how this should ensure you do not crash and rebound at the end of your transformation. Great podcast, I can’t comment on the Adonis side but wanted to know how many uncensored podcasts are left for this season?